Macaroons, what can I possibly say? I first tried these treats while living in New York City in 2011. Before then I had only heard of them. In fact, now that I think about it, I am embarrassed to admit that I didn't even try these while visiting Paris, France. You would think that would have been prime timing for my first tasting. None the less, I tried them and was hooked. In November 2012, I tested my baking skills and made pumpkin chai macaroons. I was amazed that my first attempt at this supposedly difficult recipe was a success. Perhaps there is a baking career in my future? Ever since I've wanted to make another variation on the classic recipe. 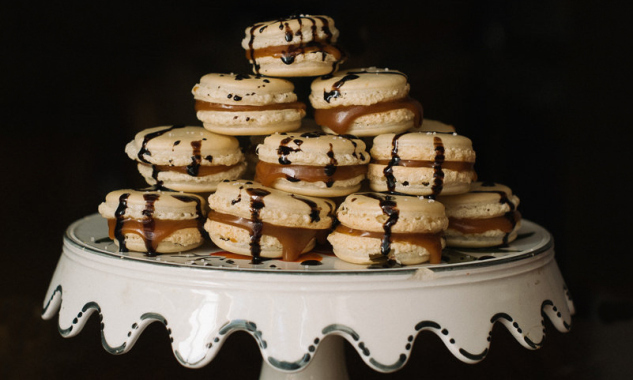 Since fall is in full swing and we are inching towards the holiday season, I decided to make salted caramel french macaroons. As I said in my last macaroon post, do not get frustrated if a batch does not turn out. They tend to be temperamental. The downside? If a batch does not turn out, you cannot salvage them. Throw them away and move on to the next batch! Practical makes perfect. The more you make these, the better you will get and learning the subtle nuances of the ingredients you work with and the effects they have on one another. The only problem with baking sweets is that I am only one guy....I eat them way too quickly. Start by shifting the powdered sugar and almond flour together. I do this twice to make sure all of the large almond chunks are removed. Whisk your egg whites until foamy. Add the salt and continue to beat until stiff peaks form. Fold your flour mixture into your eggs, turning 65 times. Make sure you do this by hand to avoid over mixing. Place your batter into piping bags and pipe 1 inch rounds onto two parchment lined baking trays. Tap each tray 4-5 times onto the counter to remove any air bubbles. Allow the cookies to sit for at least 30 minutes. Pre-heat your oven to 300 degrees and bake exactly 20 minutes. Allow to cool on a wire rack. Sandwich two cookies with salted caramel sauce and enjoy!